Le Dinh Hieu (left) poses for a picture with his students at G.A.P institute in this supplied photo. Fueled by the desire to help young Vietnamese enter a globalized, professional environment, Le Dinh Hieu, 31, chose establishing a soft-skills course in Vietnam over a well-paid job abroad in order to give back to his homeland. Hieu received a full-ride to study overseas at the age of 18 and, after graduating with a degree in Economics, immediately being working for a prominent firm in the U.S. Despite his success, Hieu felt unfulfilled, and eventually chose to return to Vietnam, where he established G.A.P, an institute which provides local youth with the skills and training they need to stand on their own today’s tech-based world. Hieu first found himself working as the institute’s headmaster by pure coincidence. During his childhood, he would often eat the Vietnamese-style pudding from a local vendor near his house in Ho Chi Minh City. The lady who worked the stall would usually be accompanied by her young daughter, just a toddler at the time. After Hieu went abroad, finished studying, and returned to Vietnam, he learned that the little girl who was once at the seller’s side was now 15 years old, pregnant, and unsure of the father. Hieu was thrown by the situation, and before long found himself working towards a solution to improve the lives of youth in the local community. He was further convinced to support change as he recalled a lesson he received back in the U.S., that “regardless of social status, age, body condition, nor race, whoever is good enough to raise above, should be provided ample opportunity to do so”. After the fateful encounter with the vendor’s daughter, Hieu returned to America to leave his job and say his goodbyes. His new life would be in Vietnam. Once back, he planned to found an institute dedicating to helping the young acquire soft skills and critical thinking. 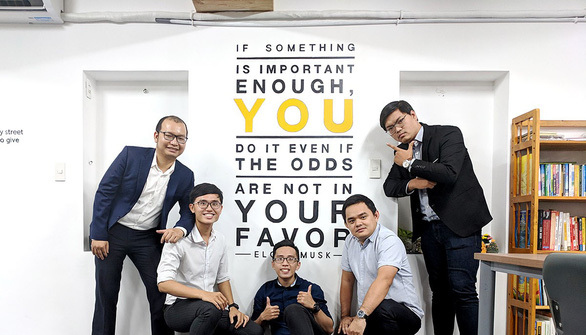 To secure a teaching location, he had to ask permission from existing language centers in Ho Chi Minh City, and finally managed to land a deal on his tenth attempt. The establishment allowed him the use of one of their rooms on weekends, free of cost. In the first six months, Hieu taught for free to attract attention and earn a reputation. Afterwards, some of the students’ parents suggested he collect tuition fees and began assisting him in procuring materials for the newfound institute. From such a humble starting point three years ago, G.A.P slowly grew. Today it boasts over 8,500 alumni. As its aim is to uplift all Vietnamese youth, Hieu tries to ensure that his courses are open to everyone. For two paying students, the institute accepts a third free of charge. Needy students or those with disabilities are also guaranteed free courses at G.A.P. Hieu also recruits his students to work for the institute and tours southern Vietnam to give inspirational speeches at various education facilities and encourage young people to find their own path. But for Hieu, G.A.P. still has a long way to go. The institute is working to persuade public schools in Vietnam to improve their extracurricular activities to better equip students with soft skills, but their recommendations often fall on deaf ears. Even worse, many underprivileged youngsters have refused to attend his courses, as they are convinced the education will do little to none to improve their situation. Though many approaches are closed off before it gets a chance to shine, Hieu never falters. Every time hardship comes to him, his mother, a musical teacher who turned deaf at the age of 30 becomes his beacon of light. Though plagued with her sudden disability, Hieu never once saw her cry, anguish, nor lash out. “Once you are faced with obstacles, try to coexist with them, and ultimately overcome them with your remaining power,” he said, citing the best quote of his mother. Asides from designing classroom projects, Hieu also sponsored construction of swimming pools, libraries, and other useful amenities for young people. According to Hieu, one of his most advantageous point is to meet up with a lot of passionate, experienced educators back in Vietnam. From their foundation, Hieu carries on to inspire more students. In order to make his mission go viral, Hieu even created a Facebook page to attract netizens into the fray. At the moment, he is cooperating with a reputable corporation in Vietnam, to provide scholarship to some 300 outstanding senior high school students across the nation. But his current concern is to provide the disadvantaged nationwide with a set of visualized textbooks, so that they too can receive proper education just like anyone else. The G.A.P Institute was selected by the UNESCO Centre for Culture, Education, and Training Organization to be a strategic partner for the Talent Generation project, which helped connect 10,000 students and create jobs for about 1,000 students from universities nationwide. In 2016 Hieu made it onto the list of the 30 brightest stars under the age of 30 in Vietnam in different fields by Forbes. Besides G.A.P, he is also the founder of Hear.US.Now, a project designed to teach English and computing skills to deaf people. Hieu’s devotion to social activities earned him the 2019 Vietnam Outstanding Young Faces Award, a highly esteemed event from the Youth Union Central Committee, aimed at honoring outstanding youths under 35 years old from across the nation.